Along the coast (of course), between Grand Baie and Cap Malheureux is spectacular Pereybere Beach. The waters here are deeper than most of the lagoons that surround Mauritius. Because of that, there is a deeper blue hue to enjoy. Pereybere Beach is a favorite among the young people. Because of this, it’s a “happin'” beach. 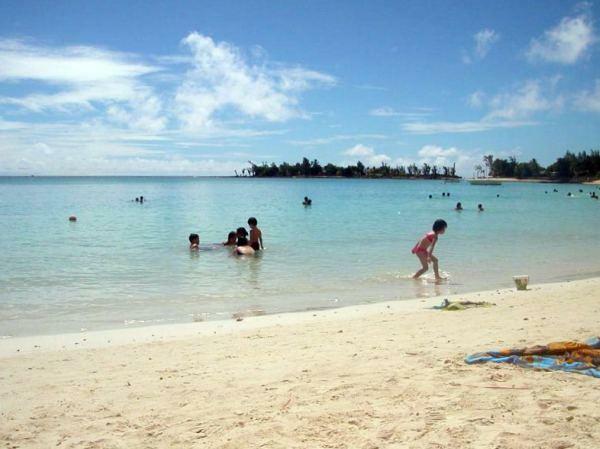 Noted as the fun beach, Pereybere is fuller during school holidays and weekends. Sand soccer games and kite surfing along with some great swimming keeps everyone in shape on Pereybere. And this is perfect for small children. The sand slopes slowing into the water and the offshore coral reef protects this shore from anything bigger than a light wave. Indeed, you’re in paradise -even the ocean agrees and makes way for the majestic beach. Because the water here is deep and crystal clear, it makes for great snorkeling. Make sure you stay along the rocky outcroppings as that is where the coral begins and fish hang out. Most of the area close to the sandy beach will have a sandy bottom and pretty much nothing hangs out there. Also remember that there may be a little sea grass in the area. Nothing to worry about; just slightly creepy to walk through and can have some smaller species of fish if you want to venture there with your snorkel gear. Again, Pereybere Beach is also excellent for families because the surf is normally calm. Take a gentle stroll down the long stretch of very white sand with your kids and enjoy the beauty of the deep blue ocean, puffy clouds, nice rush of gentle waves lapping at your feet, the crunching of silky sand under your toes, and the shimmering noise of the slow breeze snuggling the tropical palm trees the line the properties up to the beach area. Certainly Mark Twain was right in saying Mauritius is heaven on earth. And it’s true – yes, take the sunscreen, but explore, enjoy, breathe in the ocean air and thank God you made it to see on of His creations! Things to think about when taking an outing to the beach when you’re with kids: Well, our experience is that they will let you know if you’re not taking the beach toys. Make sure you have some things they can dig in the sand with and form shapes on the beach. If one of the the resorts is having a kid’s day – it wouldn’t be a bad investment to let them have their fun in the sun, too. It just makes sense. Above all, and we can’t seem to caution enough, take sunscreen and make sure you follow label directions. Don’t burn! It’s easy to do here because of the winds that blow along the beach area. Sand – medium to fine grain, coral based, some debris. Shade – casuarina and palm trees. Sports – you’ll find lots going on here. Swim, snorkel, dive, kite boarding.